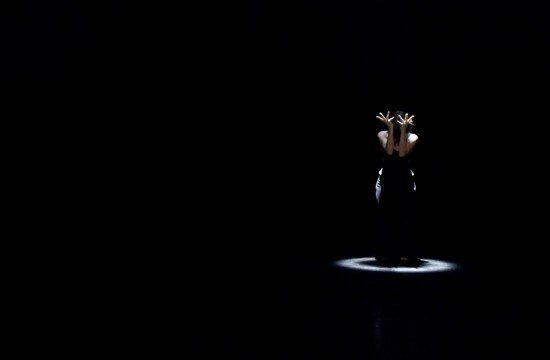 Creation 02/02/2013, Artdanse le festival, Dijon. I want to speak about birth. Some may say that this subject is to intimate and personal. I believe that it is time to go back to this moment and rediscover what we have to say about birth, what we have to learn and understand about it. Giving birth is an extreme, radical and absolute act that engages all our being even beyond what we know of our bodies and ourselves. Birth is a passage, an initiation for the mother and child, for the couple. It reveals unknown aspects about us. It is a moment of revelation, of reconnection. I have rediscovered in this project the notion of body-substance as I named it in 2007 following my research for Portraits intérieurs. For this piece my attention is given to the body sensations of bursting, tearing, pressure, weight, gushing out. On the power and softness of energies and breath. I’ll also address the notion of ritual. Jesus Christ spoke these words to Mary Madeleine when he left the tomb. They are present throughout the piece. - «Do not touch what shouldn’t be touched»; Jesus Christ asks Mary Madeleine to trust his vision instead of the material and tangible world. This trust, subtle and true, what is required at birth, allowing one to surrender to the present. - A paradox between the untouched and the immense connection of touch with a newborn. - On stage the dancer is untouchable. Clara Cornil hopes to interview men and women to know about their feelings, their expectations, their fears in connection to this event. These discussions will be used as soundtrack. From this solo, Clara wants to work with women and parents groups and to initiate support and sharing networks. CrEation the 2th of february 2013, Artdanse le festival, Dijon.